Extinction happens all the time. When you withhold your click, you set up an extinction process. If you withhold the click because you are unclear about your criteria or you’re clumsy in your handling skills, you could be setting up your learner for a macro extinction with all of the painful emotions that go along with it. Or you could be withholding the click with very deliberate intent. In this case you are using a micro extinction process to help shape a more complex behavior. You are using extinction to your advantage. The conclusion: extinction doesn’t have to be something you avoid. It can be something you actively use to create more complex behavior patterns. Today’s post shows how the shaping game, PORTL can help us understand how this works. 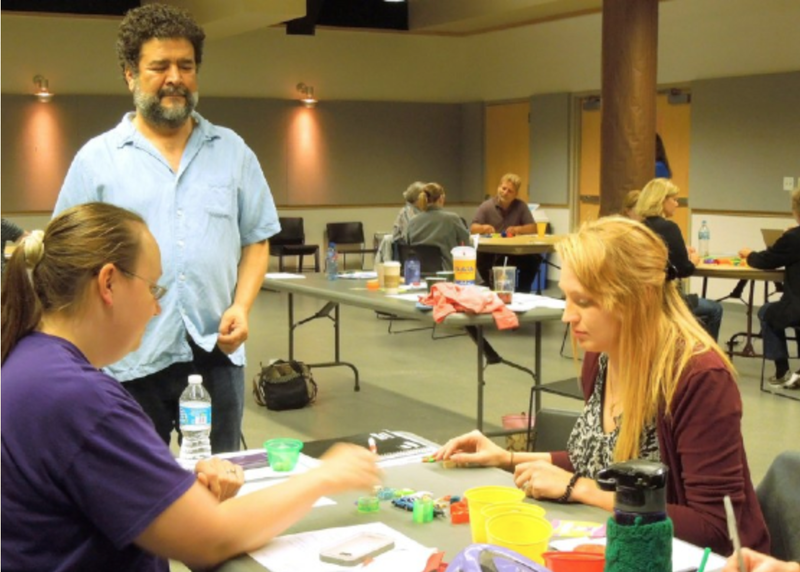 Jesús coaching participants at a conference as they learn how to play PORTL. Jesús used videos of PORTL experiments to illustrate what he meant. He reminded us that there is a difference between resurgence and regression. The first video example showed an elegant use of resurgence. The learner was taught Behavior 1: tapping a small block. Once that behavior was confirmed the block was removed and a toy car was placed on the table. Behavior 2 was rolling the toy car over the table top. When the car was brought out for the first time, there was a small extinction burst of tapping the car, but the learner quickly shifted to pushing it. When that behavior appeared to be solid, the car was removed and a third object was placed on the table. Now the behavior was lifting. Behavior 4 was a different action. The learner put a wooden ring on her finger. When each of these behaviors seemed solid, the trainer reviewed one at a time what the learner was to do with each of the objects. The trainer then placed all four objects out on the table but not in the order in which they had been taught. There was now no reinforcement given. The trainer was simply observing the learner’s behavior – not giving any feedback or reinforcement of any kind. The point was to see in what order the learner would interact with each object. The result: The learner went first to object 1/behavior 1, then moved to object 2/behavior 2, then object 3/behavior 3/and finally object 4/behavior 4. So even though that wasn’t the left to right order in which the objects were set out, that was the order in which the learner interacted with them. The conclusion: when you have not gone through an extinction process for the behaviors you are using, when you have instead reinforced them and then you remove reinforcement, the behaviors occur in the order in which they were trained. This is resurgence as opposed to regression. Now here’s the fun part. When you first extinguish the individual behaviors, you get the opposite result. Now you see regression. People will go back to the most recently learned behavior. If that doesn’t work, they’ll go a little further back, and then a little further back – thus revealing their training history. The trainer set out one item on the table. The learner began to manipulate it, trying to find out what was going to be clickable. The trainer didn’t click any of this creativity. She waited for it to extinguish and then clicked for one simple behavior – touching the object with one finger. That was the “hot” action. The trainer clicked and reinforced for successful approximations, then she took a break to record her data. She continued to train in ten click units until she had achieved a high degree of consistency in touching the object with one finger. This was the set up for the experiment. In the next phase she set out in a circle nine or ten different objects, including the one they had been working with. The learner began by touching the familiar object. That got clicked and reinforced several times, then the trainer stopped reinforcing for that object. She was using extinction to eliminate that behavior. The learner began experimenting, touching various objects, but she only got clicked for touching the one that was immediately next to the previously hot object in the counter-clockwise direction. The learner switched over to this object and began touching it consistently. So now the handler stopped reinforcing for this object and only reinforced for the next object on the circle. The learner again experimented and then discovered that the only object that she got paid for touching was the third one on the circle. When this was consistent, the handler again stopped reinforcing for touching this object. The learner was catching on to the overall pattern. Now she moved more quickly to the fourth object and discovered that was the “hot” one to touch. They continued counter-clockwise around the circle until every object had been the “hot” one once and touching it had also been extinguished. At this point the handler stopped reinforcing for anything and observed the learner’s behavior. The result: the learner quickly switched to moving clockwise around the circle, touching the objects in the reverse order in which she had learned them. So she learned them originally counter-clockwise: object 1, then object 2, then object 3, then object 4, etc. Now she was touching them clockwise: object 10 – object 9 – object 8 – object 7, etc. She wasn’t getting clicked for any of these touches, but the pattern was very persistent. So again: in the first video where the behaviors were taught, but not extinguished, the learner went through them in the order in which they had originally been learned. In the second video where behaviors were extinguished, the learner went through them in the reverse order. You won’t find these distinctions in the scientific literature. This difference in behavior relating to resurgence and regression is something Jesús and his students have been revealing by playing PORTL. This entry was posted in Five Go To Sea and tagged Alexandra Kurland, Clicker Training, Clicker Training Horses, Extinction, Five Go To sea, Jesús Rosales Ruis, Kay Laurence, Ken Ramirez, PORTL, Regression, Resurgence. Bookmark the permalink.